Here are some maps I found. Now study them closely with regard to race distribution. This will give you an idea of where whites are. But REMEMBER that the population density of the areas varies. So be very careful when studying this. Look at the densities of people and then look closely at where the whites are. If you are observant you will see some interesting things. Let me show you some things. 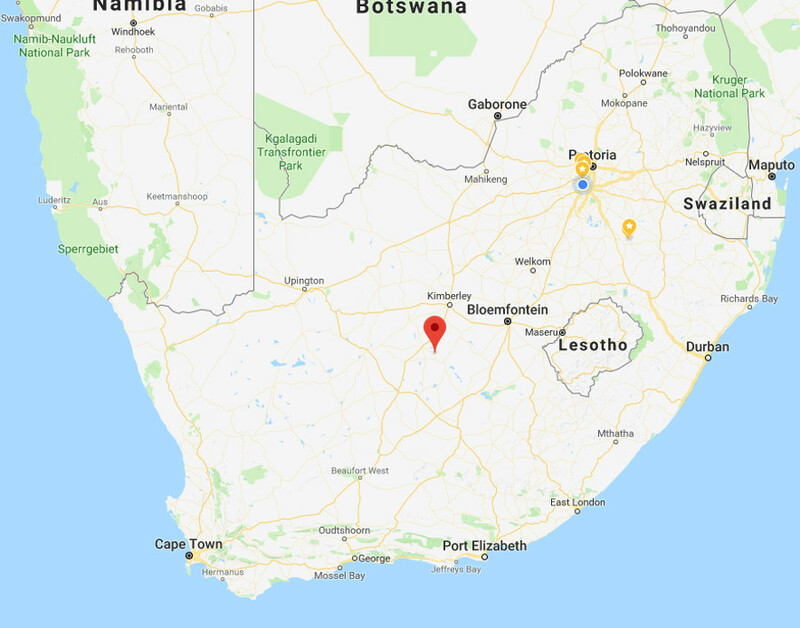 In the map below, the red flag in the centre is the exact location of Orania as well as the Suidlanders HQ. The Suidlanders HQ is at Vanderkloof which is a small holiday resort at a lake 40 Km from Orania. They are in sparsely populated areas. Take note of Pretoria and Johannesburg to the North East and Cape Town to the South West. Now this map below will provide you with context. 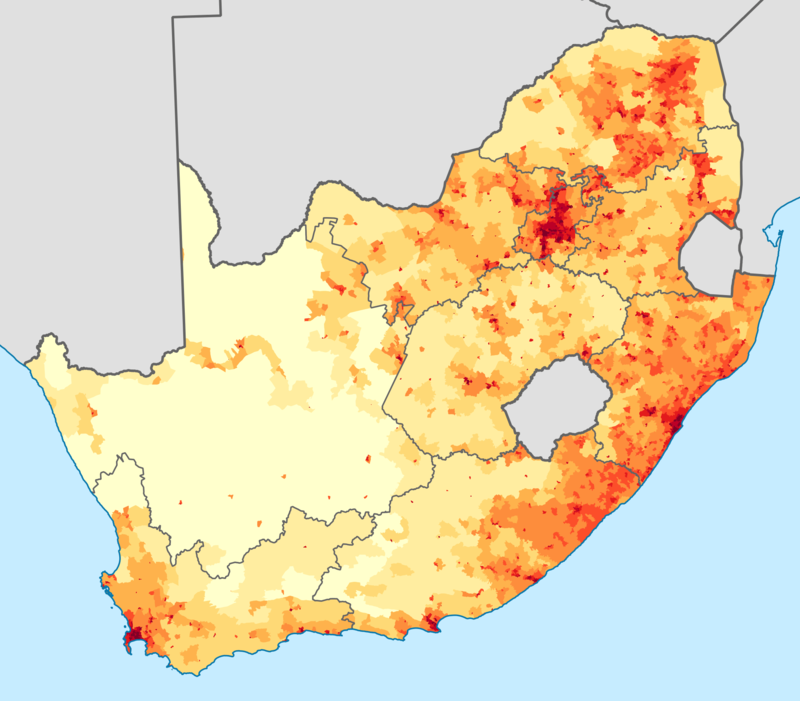 This shows you the population density of South Africa. Look at it carefully. The Suidlanders want to run away from the cities because by their idiotic reckoning due to their nonsensical prophecies, this is where white people will all be killed. So Orania and the Suidlanders HQ are near the Karoo semi desert which is to the West and South West of them. In the map below, take note of the grey state boundaries. Take special note of the small province of Gauteng which contains Johannesburg and Pretoria. This map is from the Govt. 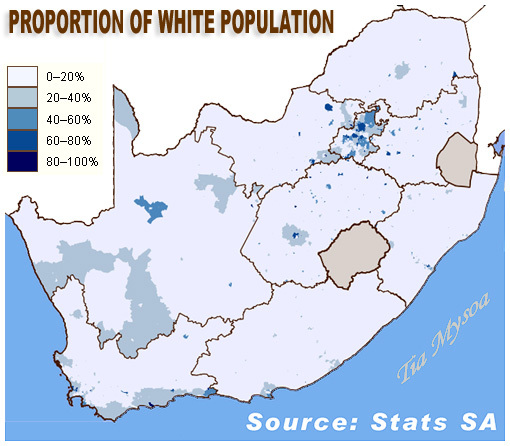 This shows areas where whites make up a higher proportion of the population. 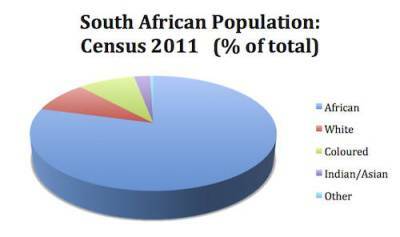 In most of South Africa whites make up 0-20% of the population. But look there are small concentrated areas where the whites make up as much as 80%+ of the population. What would have been really interesting would be a map which shows the ACTUAL POPULATION of whites in a certain area. Because then you’d see some really interesting things. Now Coloured (mixed race) people make up about the same percentage of the population of SA as whites. These coloureds mostly speak Afrikaans and they are the ONLY non-whites who voted for the white Political party the New National Party AFTER 1994. So while non-whites are unreliable as allies, I was always quite impressed by the coloureds and this strange voting pattern to vote FOR WHITES for a while (until the NNP shut down – the idiots). What this map does not show is that large numbers of blacks have been moved to Cape Town. 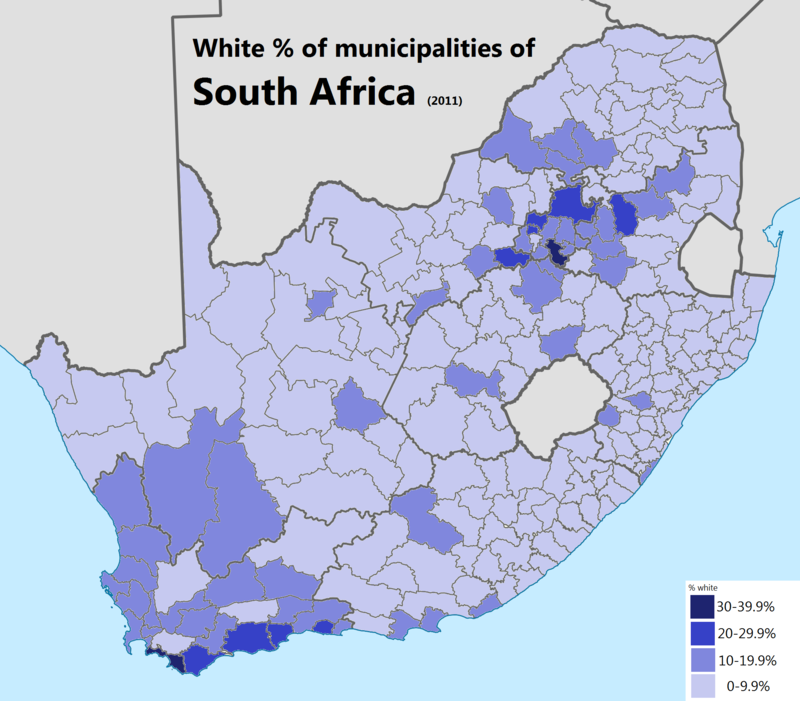 This map shows the White % of municipalities. Like the population distribution map this will give you an idea about the places where whites are in larger numbers and where they exert power. 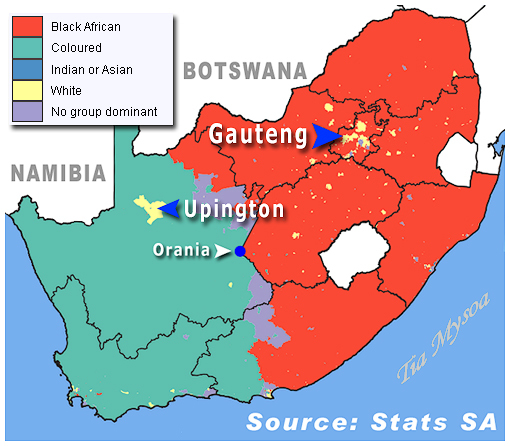 This map below shows in more detail the distribution of the races in South Africa. This one also includes Indians and Asians. The Indians have been here longer and dominate the Asian portion. Regard them as HOSTILE TO WHITES! The blacks actually don’t like them, but regard the Indians as HOSTILE TO WHITES! This map also shows you Orania/Suidlanders HQ. This map will show you why I originally thought that Whites should seize the Cape as a separate country in order to break away from the blacks. I thought the Cape would be safer for whites and easier to defend and the non-whites we’d have would be coloureds and not blacks. This final map shows the predominance of Afrikaans (Blue) versus English (Red) throughout South Africa. This will show you clearly that Natal on the South East coast was a British Colony and that Afrikaans people are not there in number. This is actually where Simon Roche grew up. Natal was seized from the Boers by the English. It also has a high population density of Zulus and not many whites. The whites who are there are normally English speaking and Liberal. 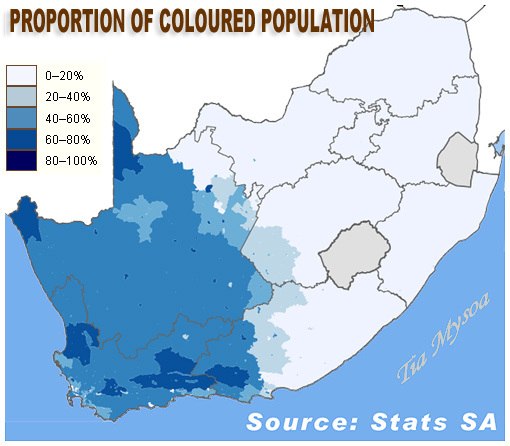 The Cape was also a British Colony, but the population there is different with more coloureds than blacks. ← Pic: BRILLIANT! HYPOCRISY: Jewish Political Correctness can make you INSANE! So Blacks are deliberately being bussed in to the Cape as a weaponised tool to alter the Colored/White demographic into a Black dominance?